The films of Iranian master Abbas Kiarostami have always explored the complex relationship of cinema to the world it reproduces and recreates in a frame. To quote a line from Certified Copy, “It’s our perception that gives [art] value.” The film, which is also Kiarostami’s first film produced and shot outside of Iran, plays with our perceptions in playful and provocative and revealing ways. Certified Copy is a truly cosmopolitan affair, with a goddess of a French leading lady (Juliette Binoche), a British opera singer (William Shimell) as his leading man, an Italian location and crew, and a meandering, introspective, fascinating conversation that slips between English, French and Italian. Kiarostami penned the screenplay himself, with Massoumeh Lahidji “adapting” and translating. Binoche plays a French-born antiques dealer and single mother in Italy (she’s never called by name in the film and is identified as “Elle” in the credits, which in French means “she”), at once pulsing with life and worn down by it. Shimell is James Miller, a British author and philosopher in Italy for the release (in translation) of his new book on art, authenticity, and value. He arrives at his press conference a calm, confident man, all reason and unflappable self-control, even when she arrives late and carries on a distracting conversation of gestures with her hungry, bored son. She arranges a kind of date with the handsome and assured author, driving him through the alleys of her small town through the countryside to a nearby village to view an “original copy” as they debate the meaning of authenticity. They can’t agree on anything, but there is something there. James is every inch the intellectual philosopher and enjoys the discussion as a kind of exercise, all romantic ideals and philosophical ideas, while Elle, far more emotionally invested, draws from her practical experience of living in the world. Over the course of the afternoon they flirt, spar and grow old together. When a chatty trattoria proprietor mistakes them for husband and wife, they simply segue into the roles and the outing becomes a portrait of a marriage fifteen years on. The transition is not exactly sudden or shocking — in some ways, it’s almost imperceptible, thanks to the graceful long takes and the easy rhythms Kiarostami’s style of heightened naturalism — but the tectonic shift is like a narrative earthquake that completely shifts the ground beneath their feet and our engagement with this characters. This is not some first date game from a nervous couple indulging in a little joke. Their whole relationship shifts with it: awkwardness and nervous chatter gives way to the rhythms and comfort of old habits and the disagreements of earlier conversations harden into frustration and exasperation over long-standing aggravations. As the afternoon date becomes a wedding anniversary, old patterns of arguments play out all over again in tetchy exchanges and emotional collisions, or so we can gather from the resignation of their responses. There are moments while watching a film by Abbas Kiarostami when I feel cinema being reinvented in front of my eyes. It’s a feeling that sneaks up through the surface modesty his features. On the surface Kiarostami appears to be working in a style inspired by films such as The Bicycle Thief and Rome, Open City, the shot-on-the-streets approach of Italian neo-realism, working non-actors and real life events into the fictions of their films. This documentary-style directness and simplicity isn’t surprising given his background of almost two decades making non-fiction shorts and features, but it’s really only a starting point for his cinema. Kiarostami’s richly layered style and structure belie the simplicity and immediacy of his films’ quiet surfaces to explore increasingly complex relationships between actor and character, story and the storyteller, presentation and audience. This style culminates in the power, beauty and dignity of his 1997 masterpiece A Taste of Cherry. You can see the development of the artist through his “Koker Trilogy,” three films pulled together not by character and story but place and theme. His development comes into sharp relief as he questions the very naturalistic roots of his first film. Where Is The Friend’s Home (1987) is Kiarostami’s first and most conventional fictional feature, the tale of Ahmed (Babek Ahmed Poor), a schoolboy who discovers he’s accidentally taken home his pal’s notebook and travels to a nearby village (against the express orders of his mother) to return it. Impulsive, willful, stubborn, and shy, his face tightens in anxiety as he’s confronted, berated, and ignored by adults on his mission of honor. In an early scene, when the schoolteacher rips up his friend’s homework “to teach him a lesson” and sends the boy into tears, Ahmed looks off in pained discomfort, his teddy bear eyes searching for some neutral place to fix. On one level Kiarostami paints a society rooted in authoritarian demands, but on another he reminds how us kids get lost in the grown-up world of business and responsibility. 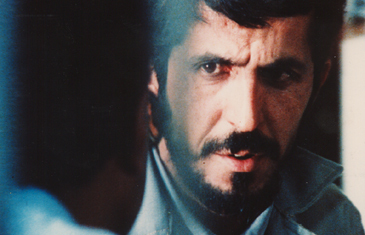 These moments from the documented trial resonate through Close-Up, Abbas Kiarostami’s 1989 film of the event. Kairostami, best known to American audiences for Through the Olive Trees and the Cannes Film Festival Palme d’Or winning A Taste of Cherry, read about the story in the papers and convinced Sabzian and the Ahankah family to play themselves in a dramatic recreation. The case itself is hardly sensationalistic. Sabzian met Mrs. Ahankah on a bus and passed himself off as Makhmalbaf (the scene is recreated by the participants in the middle of the film and establishes an unusual bond between the two—when the police come to arrest him in a later recreation she steps up to stop them). It’s simple bit of role playing that Sabzian pushes into an elaborate charade when he proposes that the family act in his next film and becomes a frequent visitor to their house. Intercut with these extended scenes is the documentary record of the real trial (which Kiarostami convinced the judge to let him not only film but in some ways shape for the camera) and a series of on-camera interviews. What emerges isn’t so much a merging of the two forms as an inquiry into the very nature of cinematic representation.